Raymond W. McDowell of Mustang, Oklahoma was born to Ola and Glen McDowell on October 21, 1936. He went home to meet them and stand in the presence of our Lord on February 3, 2019. His 82 years on this earth were spent following God's will for his life as a son, brother, husband, dad, grandfather, pastor, farmer and friend. Raymond was called to God's service as a pastor at an early age. He was raised in a loving home with his sister's Sue and Glenda. After graduating from Putnam City High School at 17, he attended Oklahoma Baptist University. He majored in English, ran track, and was involved in intramural sports. Through his life he remained involved with his alma mater. Today, the OBU McDowell Family Intramural program is named in his honor for his contribution and support of OBU's continued work of preparing students to take the gospel to the world. He completed his education by receiving his Master's degree from Southwestern Baptist Theological Seminary. 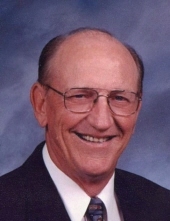 Raymond pastored several Oklahoma Baptist churches throughout his ministry. (Fallis, Galey, Sharon, Binger, College Heights) He completed his full time service as pastor of Chisholm Heights Baptist Church after serving for 20 years. Following his retirement, Raymond continued in ministry as an interim pastor in several different churches. He enjoyed serving on the Board of Directors for the Baptist Foundation and as a mission property procurement for the Capital Baptist Association. Raymond was married to Charlotte Standridge for 59 years. She served by his side throughout their ministry. His children continue his work for the kingdom in their communities and beyond as he taught. Raymond was also an accomplished farmer and business man. McDowell Farms survives as a lasting blessing for his family. Raymond enjoyed working, studying, traveling, talking, and playing golf. He and Charlotte were able to complete their goal to play golf in all 50 states. They enjoyed spending their last years together traveling with friends to Angel Fire, NM in the summer and South Texas in the winter. Raymond was notoriously clumsy. He fell from a truck, a combine, and from the roof of College Heights Baptist Church. He proved to be incredibly resilient throughout his life. Whatever life threw him; he remained steadfast and faithful to his call. Raymond is survived by his wife, Charlotte McDowell of the home. Glenette Russell and husband Tim of Chickasha, OK. Along with a great number of nieces and nephews. Glen and Ola McDowell (parents) and infant daughter. To send flowers or a remembrance gift to the family of Raymond W. McDowell, please visit our Tribute Store. "Email Address" would like to share the life celebration of Raymond W. McDowell. Click on the "link" to go to share a favorite memory or leave a condolence message for the family.